The following content has been included with the release of Ver. 1.2 on 3/5/2015. You can transport save data from the demo version to the full version (only after the first playthough). Support for the New Nintendo 3DS(TM): Use ZL / ZR Buttons to change weapons and enjoy faster load times, improved overall performance, etc. A new Boss Rush Mission is now playable: Earn 1000 Kudos to hear "Eternal Blue", the English version of Lumen's Beyond the Blue song! Lumen's brand new song "Sakura Efflorescence" has been added to the list of songs available in normal mission playthroughs. The ending theme song has been changed to Joule's new song "Cyanotype". Some script errors have been corrected. Other miscellaneous fixes have been implemented as well. Scan the following QR Code with a Nintendo 3DS that is connected to the Internet. 1. From the Home Menu, press the L and R Buttons at the same time to open up the camera. 2. Touch the on the left side of the bottom screen. 3. 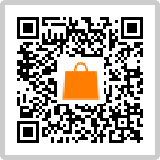 Use the camera to capture the QR code, and you will be taken to the download screen for the version update. ※ Click here for information on how to connect your system to the Internet. Search for something such as "Gunvolt update" on the Nintendo eShop and select the Azure Striker Gunvolt 1.2 Update Data entry in order to download the update. Once the Ver. 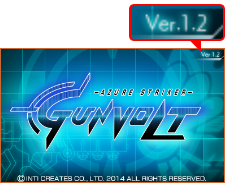 1.2 update has finished downloading and installing, start up Azure Striker Gunvolt. If you see "Ver. 1.2" on the Title Screen, than the update has been completed successfully. ※ The data for the update saves to an SD Card, so make sure you have enough space on your SD card. You can check the status of your SD card by going to the System Settings menu and choosing Data Management.